Magnetic Resonance Imaging (MRI) is a safe, painless and powerful diagnostic imaging test. MRI technology is very complex but essentially uses a strong magnetic field and radio waves to produce exquisite images of many of the body’s internal structures. MRI is a very safe test because it does not use radiation to collect the images. Scans are typically completed within 20 to 30 minutes. 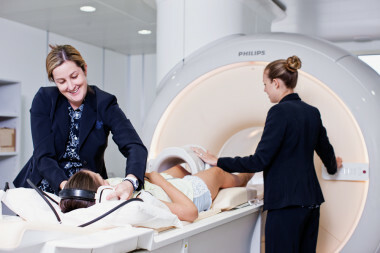 Before you have your scan, you and your mum or dad will be asked some questions to make sure you have no metal in your body that is not safe to go into the scan room. If you are wearing clothes that have metal on them (like zips or buttons) you will be asked to change into a gown. You will be given a locker to put both yours and your mum or dad’s personal items into. Please make sure mum or dad bring all of your previous x-rays to the appointment. This is really important as the doctor who looks at your MRI scan might need to look at these too. Your mum or dad are very welcome to come into the room with you whilst you have your scan. When you enter the room, you will be asked to lay on the bed and a camera will be placed on the area of your body we are taking pictures of. The scan does not hurt you but it does make lots of loud banging, thumping and whirring noises so you will be given some earplugs or head phones as hearing protection. You will also be given a buzzer to hold that you can squeeze to stop the scan if you are not comfortable at any time. When you are ready you will be moved into the middle of the tunnel and the scans will start. In-between the pictures being taken, the radiographer will talk to you to make sure you are okay. It is very important that you lay as still as you can during your scan so the pictures come out clearly. Most scans take between 20 and 30 minutes. No not at all. MRI is safe, painless and does not use any radiation. It is just a bit noisy! Will I need to have an injection? Most scans can be done without any need for an injection, however, sometimes we do need to give a special dye as part of the test. If you need an injection, the technician will talk to you and your mum and dad about it first. All the pictures from your MRI scan will be looked at by a specially trained doctor called a Radiologist. Because the MRI scanner takes a lot of pictures it can take several hours for the radiologist to look at all of them and issue a report. The results are then sent to your doctor, though it might take up to a day or two for the results to get back to them. Is the cost of my scan covered by Medicare? 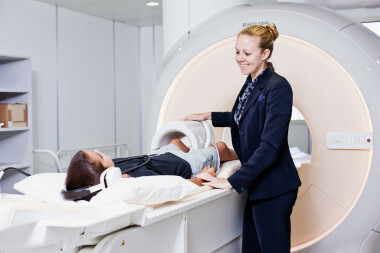 General Practitioners can now request a MRI investigation for a small number of clinical conditions for children less than 16 years of age that will attract a Medicare benefit. However, if the reason you are having the scan is not covered under these guidelines you will be responsible for the full account. If you are unsure if your scan is covered please speak to one of our staff when making your appointment. Please download and print out our MRI Procedure Screening Form, complete it and bring it to your appointment. If you answer ‘Yes’ to any of the questions, please contact us prior to your appointment to discuss.